Nearly thirty years ago, when serious work on the social, cultural, and emotional history of the Third Reich first began in the shadow of the fiftieth anniversary of the Nazi seizure of power, a series of fine distinctions continuously kept the collective nouns “German” and “Nazi” apart. Particularly the concept of “Resistenz” (Martin Broszat), as well as evidence for public disappointment with economic achievements (Ian Kershaw) and sheer opportunism, left behind such a fragmented picture of the Third Reich that the question eventually could be posed: “Where Did All the Nazis Go?”. Today, the dominant interpretation has shifted in the opposite direction, stressing the overall legitimacy of the Nazi revolution, although important voices warn against the “largely simplistic” if “widely popular” “hypothesis that the Nazis hardly needed to terrorize Germans who were allegedly enthusiastic Nazi supporters and collaborators right until the regime’s downfall”. A key element in rethinking the overlap between “Germans” and “Nazis” has been closer consideration of the idea of the “Volksgemeinschaft.” The contributors gathered in this timely and wide-ranging volume offer a sophisticated assessment of how the promise of the “Volksgemeinschaft” provided support for the National Socialist regime and contributed to its radicalizing dynamic. The term “Volksgemeinschaft” is notoriously vague, but important to comprehend in its plural meanings because it saturated German political discourse in the era of the world wars. As Frank Bajohr and Michael Wildt stress in their useful introduction, the “Volksgemeinschaft” was not so much a recuperable political union beneath the surface of political, economic, and religious division than a projection onto the future in which Germans could imagine a greater sense of social recognition, social mobility, and political and military security. It encompassed an imagined Germany in which individual tribulations in the present were redeemed in a collective pact of capacity, opportunity, and power. Moreover, the “Volksgemeinschaft” was not a Nazi concept, although the Nazis were its most effective stewards by the early 1930s. Every Weimar-era party except for the Communists deployed the discourse of “Volksgemeinschaft”, which was rooted first and foremost in the experience of war and defeat. The idea of the “Volksgemeinschaft” combined a sense of social inclusion, but also invoked the fragile and jeopardized German “Volkskörper”, the maintenance of which required political vigilance against internal and external enemies. There was always something embattled about the “Volksgemeinschaft,” a state of emergency the Nazis embellished. While not the exclusive object of nationalists, the “Volksgemeinschaft” worked to their advantage because the problem of “Versailles” privileged the establishment of unity over the representation of difference. Moreover, the “Volksgemeinschaft” had an authoritarian edge because it was expressed in the singular case without suggesting a method for deciding exactly what was the common interest and who would decide it. Sweden’s “Volksheim”, which Thomas Etzemüller discusses in a rich chapter, was always more benign because it was not conceived in the opposition of friend and foe. Michael Wildt explores the broad legitimacy that the term “Volksgemeinschaft” enjoyed during the Weimar Republic. Quite rightly he points to the appeal of the idea of community deep into the Social Democratic camp and illustrates the desire for union even in associational life. Football, for example, had become a genuine piece mass culture which featured reconciliationist movies such as “Elf Freunde müsst ihr sein”! This is an important point to make because National Socialism was created by all sorts of “national socialist” micropolitics long before the Nazis came onto the scene. As a result, the accomplishment of the “national revolution” in 1933 was not seen as a strictly Nazi accomplishment. The work of renovating the nation continued after 1933 in a dozen auxiliary organizations associated with National Socialism: Volkswohlfahrt, Deutsche Arbeitsfront, the NS-Frauenschaft, and so on. Indeed, the “Volksgemeinschaft” could be cognitively distinguished from National Socialism so that many contemporaries could – and I put this somewhat sharply – love the Third Reich, but hate the Nazis. Postwar memories made this distinction more emphatic because it was so helpfully exculpatory. Yet Weimar was a deeply divided society, even more so in the lived rhythms of associational life than in the political struggles in the Reichstag. Only one party deliberately put forward the political goal of overcoming the class and particularly the political differences between Right and Left. But the DDP was the very first party to be crushed by Weimar politics. One reason, I think, for the intense political hostilities in Weimar was the notion of “Volksgemeinschaft,” which imagined an endangered, pure “Volk,” beset by impure outsiders. Mounting casualties in World War I, military defeat, Versailles, and the “upside-down” world of the inflation all fortified this logic. As a result, political struggle was urgent, vigilant, and ferocious. The Nazis may well have appeared as a compromise; on the one hand, from the point of view of German nationalists, they deserved credit for smashing the Social Democrats and Communists and, on the other, from the view of long-standing trade unionists, they deserved credit for wrecking local “Honoratiorenpolitik”. But the Nazis also worked hard at repairing divisions, even when they created new ones. Unfortunately, this volume does not discuss the Reichsarbeitsdienst, even in passing. Yet it was in the closed camps and communal barracks of the six-month labor service that millions of Germans considered their responsibilities as “Volksgenossen” and comrades, their own interweavement in self-enclosed social milieus, and the sacrifice they might owe to the national whole. In the end, it was middle-class Germans who had to do the adjusting in these “volksnah”, quite proletarian installations; many had a hard time, but many also cherished their experiences, even when they opposed the Nazis on other points. Precisely because the “Volksgemeinschaft” was an imagined community it was an inherently dynamic concept. It released enormous energies to renovate the German body: “Nicht egalitärer Stillstand, sondern rassistische Mobilisierung kennzeichnete die ‚Volksgemeinschaft‘“ (p. 10). Abroad, it facilitated war, conquest, and a new European order. At home, it was associated with a “gefühlte Gleichheit” (Norbert Frei, p. 9), but also “Aufbruch und Modernität” (p. 82). New industrial projects pulled in young workers with generous piece-rate wages, as Frank Bajohr discusses for “Mitteldeutschland” and the aviation industry. Armin Nolzen shows how opportunities for political leadership and administrative responsibility proliferated in the Nazi-sponsored organizations charged with the collective management of national life (Volkswohlfahrt, Luftschutzbund, Hitlerjugend). Women advanced unequally on this terrain but they did so generally as ideologically self-conscious “Wahrerinnen der ‘arischen’ Rasse” (p. 98). As Sybille Steinbacher explains, the war intensified the “militarisierte Kameradschaft der Geschlechter” (p. 100). Wartime hardships also accelerated the transformation of citizens into “Kumpel” (p. 179), and here the fascinating spaces of “Bunker” and “Luftschutzkeller”, insightfully investigated by Dietmar Süss, are of central importance, although the transformation was always more effortless in postwar memory than in wartime practice. Süss’s analysis invites further work on Nazi spaces; “Jugendfahrt”, “Arbeitsdienst”, “Barracke”, and “Bunker” were new destinations in the totally mobilized landscape of the Third Reich. It was in their roles as low-level leaders that millions of Germans came to accept the increasingly self-evident necessity of managing collective life, of overcoming the deleterious inheritance of milieu, and of distinguishing “healthy” from “unhealthy” components in the social body. The work of social reconstruction fertilized the memories of cooperation and solidarity after the war, which Malte Thiessen analyzes in a brilliant, final chapter. It also enabled Germans to differentiate their “Third Reich” from “those” Nazis (“denen in Berlin” [p. 170]), although I think Thiessen underestimates the lingering guilt about participation in the racial project which may well have underwritten the readiness of citizens in the Federal Republic to amnesty Nazis as they had amnestied themselves and their fathers, brothers, husbands, and sons in the Wehrmacht and SS. 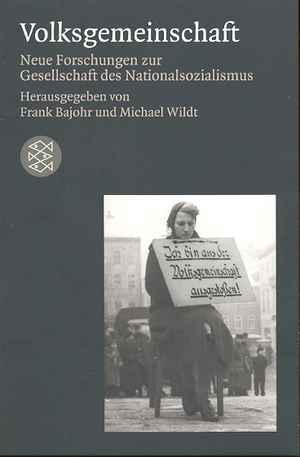 After the war, the former personnel of what Frank Thiess himself called the “Grossorganisation” (p. 168) and survivors of the wartime “Schicksalsgemeinschaft” more generally retraced the boundaries of the “Volksgemeinschaft” in their ongoing “Stammtisch” conversations about sorrow and pleasure in the Third Reich, in their early mistrust of returning émigrés (such as Thiess’ antagonist, Thomas Mann) who had quite different perspectives, and, it might be added, in the subsequent marginalization of new immigrants to Germany whom even critical engagement with the Nazi past excludes. The task of creating the “Volksgemeinschaft” established a new order of difference in which newly imagined “Volksgenossen” stood opposed to asocials, Jews, and other “Volksfeinde.” But other differences emerged as well. Unevenness was sometimes accepted as was the case in occupied Poland where, as Birthe Kundrus convincingly demonstrates, racial definitions became increasingly “fluid” in order to maximize the retrieval of German blood (p. 121). However in the case of Jewish “Mischlinge,” who were the object of obsessive debates about where the “genetic” lines between Germanness and Jewishness should be drawn, life in Germany became more and more difficult. It is too bad that in her discussion of “Mischlinge,” Beate Meyer misses the chance to track how “Mischlinge” themselves negotiated their torn allegiances, which often remained surprisingly open to the “Third Reich” if not to its National Socialist wardens, one further register of the desire for the “Aufbruch” the “Volksgemeinschaft” seemed to offer. Very early on the Nazis captured the discursive “Deutungshoheit” of twentieth-century German modernity by getting the majority of Germans to at least consider arguments for the fundamental importance of rupture and coordination, comradeship and selection, and the collective management of national life in perceived conditions of international jeopardy. It was in this respect first that the “Volksgemeinschaft” was a “Zwangs-” or “Notgemeinschaft,” a persuasive case for order and opportunity. Peter Fritzsche, Where Did All the Nazis Go? Reflections on Collaboration and Resistance, in: Tel Aviver Jahrbuch für deutsche Geschichte 23 (1994), pp. 191-214. Christian Goeschel, Suicide in Nazi Germany, Oxford 2009, p. 169. Peter Fritzsche: Rezension zu: Bajohr, Frank; Wildt, Michael (Hrsg. ): Volksgemeinschaft. Neue Forschungen zur Gesellschaft des Nationalsozialismus. Frankfurt am Main 2009 , in: H-Soz-Kult, 15.12.2009, <www.hsozkult.de/publicationreview/id/rezbuecher-13522>.